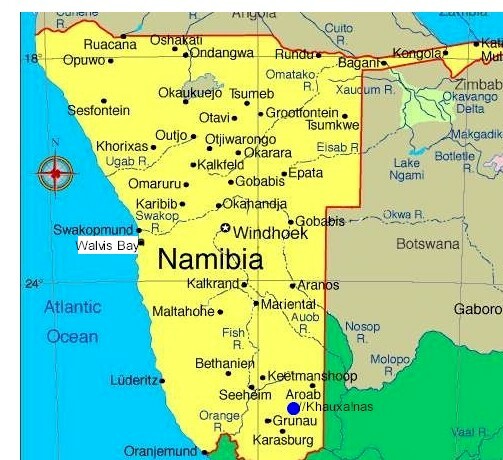 Information about one of the oldest Namibia's National parks. 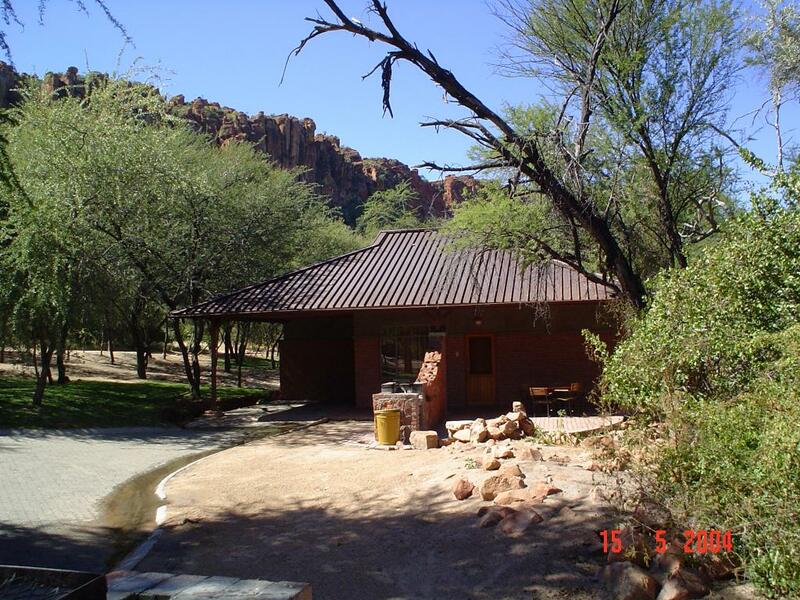 The Waterberg Park is located 280 km north of Windhoek. The mountain owes its name to the springs surfacing on its lower slopes, and the lush vegetation that grows here contrasts sharply with the thorn savannah of the surrounding plains. The plateau itself is one of the most interesting geological sites in the country. Some features such as dinosaur tracks and petrified dunes make it almost a must stop for travellers on the way further north. One of the reasons for establishing the park was to protect and resettling endangered species (black and white rhinoceros, buffalo, roan and sable antelopes). It is also not unusual to encounter leopards, rock dassie, klipspringer, tsessebe, wild dog, lesser bush babies and cheetahs. The only Cape vulture colony in Namibia lives in the Karakuwisa mountain on the western edge of the Waterberg plateau. The area is also rich in a plant life. The total of approximately five hundred plants have been recorded in and around the park. The geology of the plateau is as interesting as history of the area. The eroded sedimentary rock which forms it was deposited during Karoo Age about 220 to 180 million years ago. 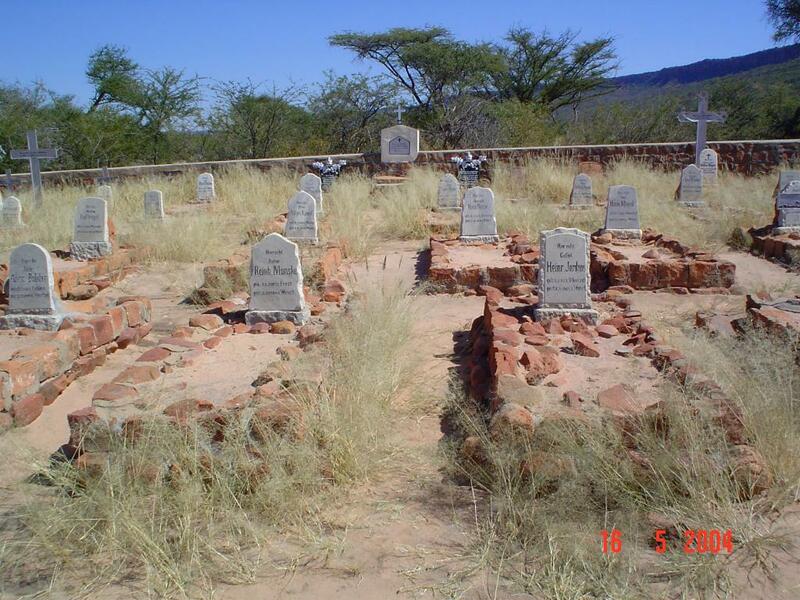 A Rhenish mission station was established at the Waterberg in 1873, than later destroyed during Nama/Herero wars and rebuilt again in 1891. 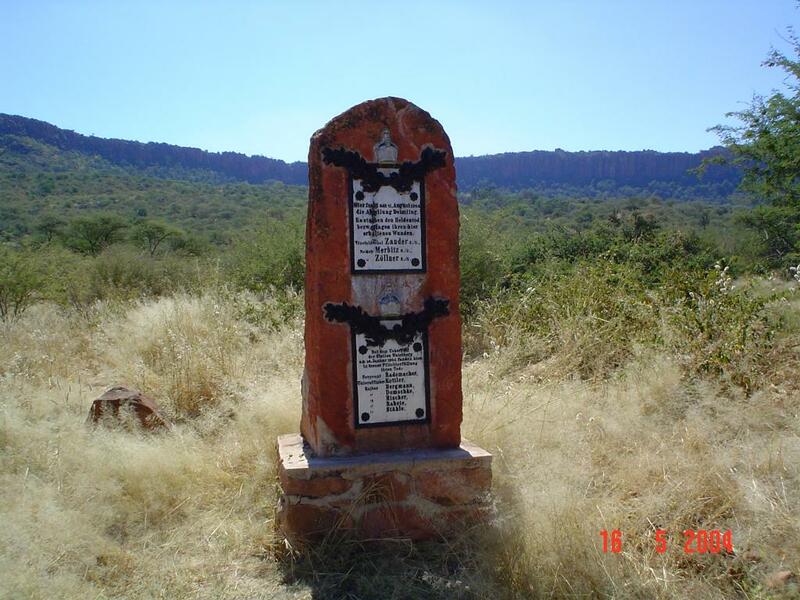 During 1904 in time of Herero Uprising the battle between Hereros and German Colonial forces took place at the Waterberg. 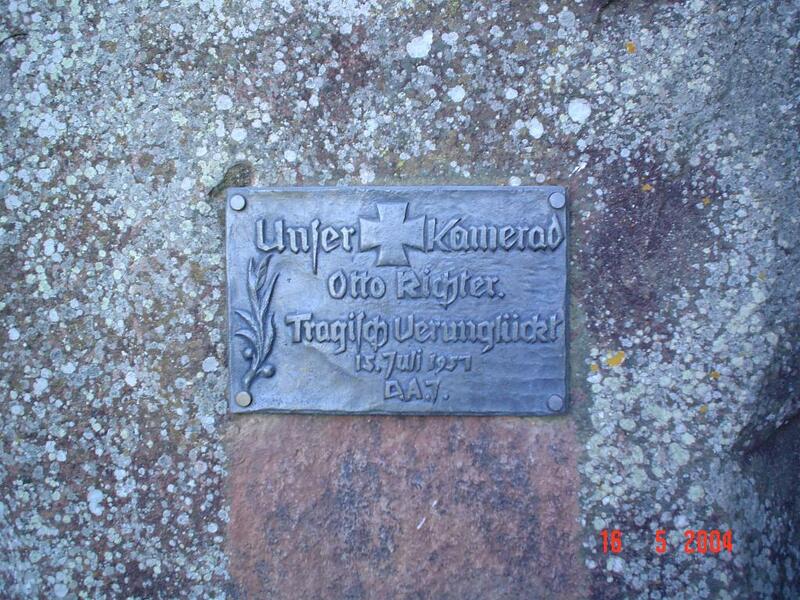 As a reminder of this event a graveyard can be seen in the vicinity of the camp. The rest camp can accommodate more than 200 people. There is a petrol station and a shop at the camp. Camping sites are also available. Unfortunately private vehicles are not allowed to drive to the plateau but regular excursions are organized daily by park personnel. Bernabe de la Bat Rest Camp. 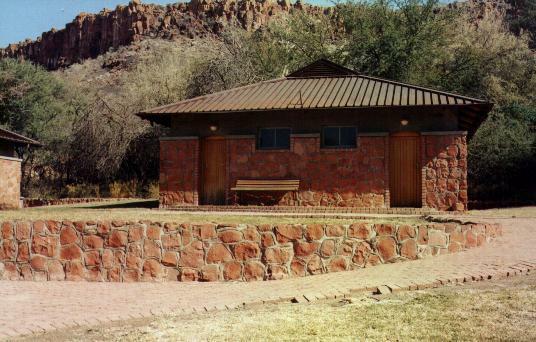 Nestling amongst indigenous vegetation, this delightful rest camp was named after the first director of Namibia's Department of Nature Conservation. The camp was designed to blend with the surroundings, and during construction as little as possible of the natural vegetation was disturbed. In addition, the reddish brown sandstone bricks of the buildings and their copper-coloured roofs echo the colour and texture of the cliffs overlooking the rest camp. Accommodation ranges from four and three bed bungalows to deluxe rooms sleeping two people. Bungalows are equipped with a hotplate, refrigerator and kettle, but no crockery, cutlery or cooking utensils. There are also shaded camp sites with communal ablutions and field kitchens. Other amenities include a swimming pool with a superb view of the cliffs, a restaurant, shop which stocks frozen meat, tinned goods and curios, and a filling station where only petrol is sold. Flora. One of the Waterberg's many interesting facets is its diversity of flowering plants, trees and shrubs. Enormous common cluster leaf figs form dense canopies in the vicinity of the springs, where ferns create a verdant undergrowth. Magnificent karee, lead wood and buffalo-thorn trees can also be seen here. The broad-leaf woodlands of the sandy plateau are typical of the sandveld of eastern and north-eastern parts of Namibia. There are also striking silver cluster-leaf with its silver grey foliage, wild syringa and Kalahari apple leaf. Among the rocky outcrops there are the weeping wattle, its striking yellow flowers appearing from September to December, the lavender bush and the laurel fig, which clings tenaciously to the rocks against which it grows. Adding to the beauty of the rock faces are splashes of brightly coloured lichens, of which there are over 140 species in the Waterberg. Fauna. The park was proclaimed in 1972 as a sanctuary for Namibia's declining eland population and as a breeding centre for rare and endangered species. Among the game roaming on the plateau are black and white rhino, buffalo, giraffe, roan, and sable. Other common antelopes include kudu, impala, gemsbok, eland, klipspringer and steenbok. Predators are represented in the park by leopard, cheetah, brown hyena, caracal and black-backed jackal. While it is usually the larger animals that receive the most attention, the environs of the Bernabe de la Bat Rest Camp are home to several delightful small mammal species. The diminutive Damara Dik-Dik can sometimes be seen in and around the rest camp, while lesser bush babies might reveal themselves at dusk. Along the Forest Walk packs of banded mongoose are often encountered. Accommodation only: children under the age of 6 stay free of change, 6-12 years old pay 70%. Provision for children will be made upon arrival; however the booking must be made in advance. Shop, kiosk, swimming pool, restaurant, fuel (no diesel). No banking facilities. Flap chart, overhead projector, table/chairs and white screen. Departure times: 7.00 a.m. and 3.00 p.m. Duration: approximately 4 hours. Rate: on request. Minimum 6 persons. There are few true undisturbed, ecologically-sound, natural areas remaining in the world today. Areas where animals and plants have been 'spared' and allowed to flourish in their own right. Areas sheltered from the havoc wreaked elsewhere by man. Namibia however, is fortunate in having a number of areas such as this, one of the most spectacular of these undoubtedly being the Wilderness area of the Waterberg Plateau Park. 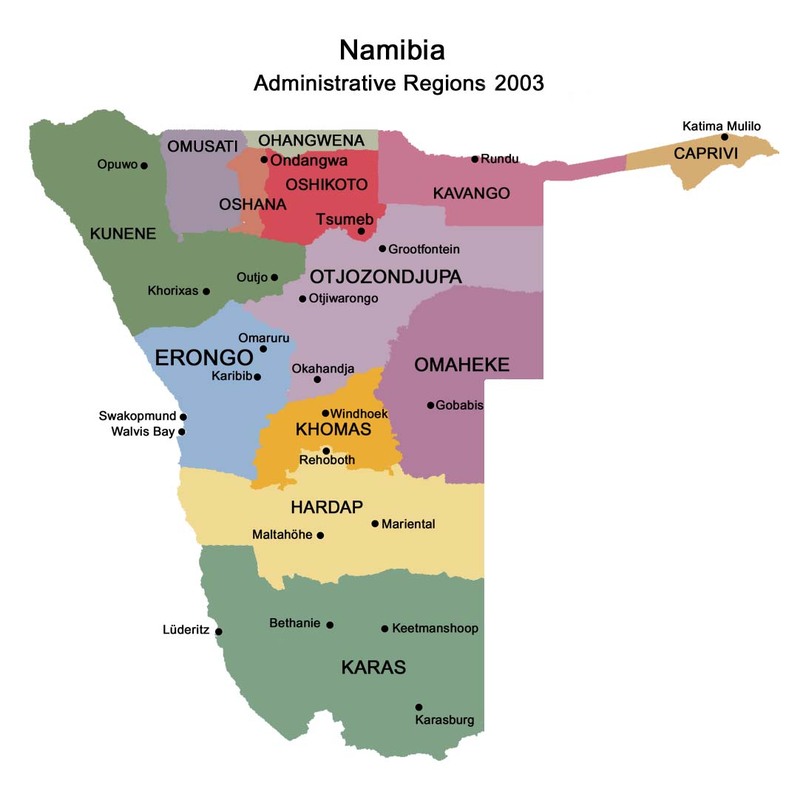 From Windhoek, take the B1 through Okahandja (68 km) en route to Otjiwarongo until you reach the C22 Okakarara turn off (161 km from Windhoek). Then continue on for about 33 km until you reach the D2512 turn off to Waterberg. 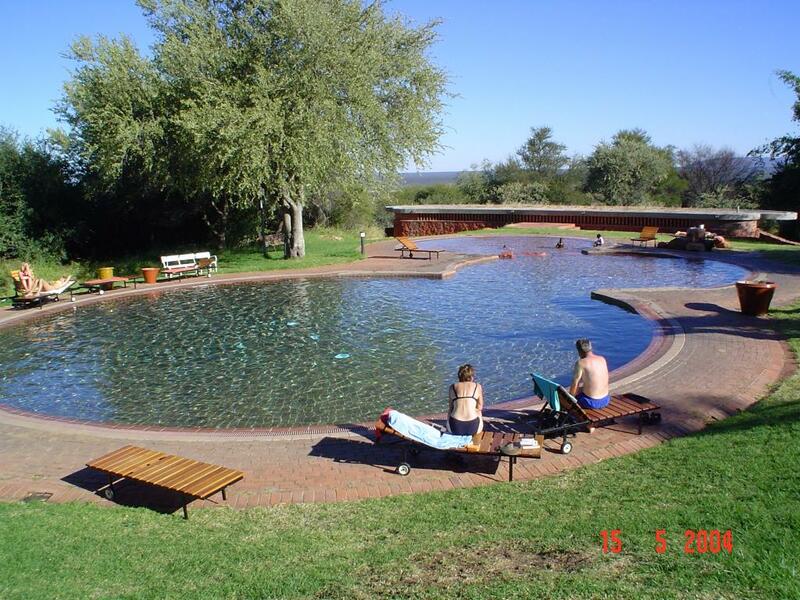 From there you drive east for approximately 18km on the gravel road until you reach the Waterberg Resort. The Waterberg Camp offers accommodation in comfortable premier bush chalets, two and four bed bush chalets and double rooms, all nestled along the base of the Waterberg plateau cliffs, amongst towering trees. the restaurant , bar and kiosk are housed in the historic Rasthous, originally built in 1908 and used as a police post for several years. A shop, Swimming pool and camping site are also available. 8 Premier Chalets: 2 beds, 1 room; deluxe double chalet, with double bed, en-suite bathroom, fridge and tea station as well as braai facilities. 4 Family Chalets: 4 beds, 2 rooms; with two en-suite bedrooms, lounge area, kitchenette with fridge, tea station and breakfast table and outside braai facilities. 11 Bush Chalets: 4 beds, 2 rooms; chalet with two bedrooms, both en-suite, lounge area with breakfast table, fridge, tea station and braai with seating area. 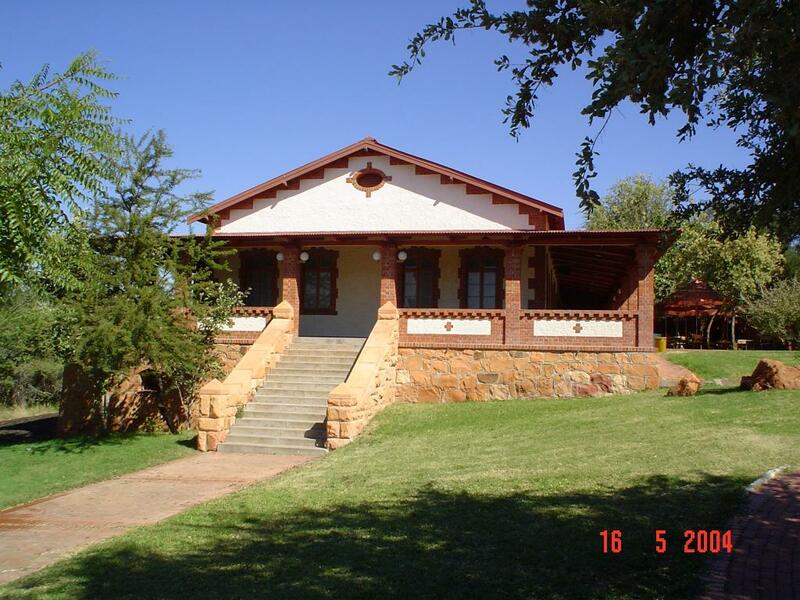 12 Bush Chalet 2 beds, 1 room; Double chalet with bathroom, lounge area with breakfast table, fridge, tea station and braai with outside lounging area. Double Room 2 beds, 1 room; Comfortable double rooms with en-suite bathroom, fridge and tea-station. All camping sites are outfitted with braai facilities, power points and cold & hot water. Flood-lit Waterhole, guided morning and afternoon Game Drives, Nature Walks within the camp, hiking trails. Booking should be done in advance with the Waterberg Resort. The origin of Waterberg dates back some 180 - 200 million years ago, when desert conditions prevailed in southern Africa. Large portions of the subcontinent were covered by an up to 300m thick deposit of red dune sand. Over time, this sand solidified to form a hard red sandstone rock known as Etjo Sandstone. During the past 100 million years, this sandstone has gradually been eroded away leaving behind only erosional relics which today form impressive mountain scenery. In 1972, the Waterberg Plateau Park (41 000 ha) was proclaimed as a park for the purpose of breeding and maintaining populations of rare and endangered animal species in Namibia. (Since the proclamation of this area, many endangered species such as the white & black rhino, buffalo, tsessebe, sable, and roan antelope have been successfully relocated to this region where their survival is now ensured.) A total of 18 000 ha of the park was set aside by the Directorate to be preserved as a wilderness area. It is indeed a privilege to have the opportunity of spending time within a natural area such as the Waterberg wilderness, to appreciate the natural beauty and become involved in it's tranquility. Trails offered by the Directorate parks and wildlife Management within this wilderness make it possible to experience and enjoy a venture such as this. To minimise the impact trails would unavoidably have on the fragile ecology of the area, no set trails have been laid out for people to follow, instead, groups will be led by a Nature Conservator with a sound knowledge of the Waterberg. The Nature Conservator will provide the group with information concerning the flora, fauna and geology of Waterberg and on conservation in general. Visitors will pass through the dense, dry woodland savanna vegetation, pursuing natural routes such as game tracks, and canyons, between towering pillars of wind sculpted rock, and through dry water courses. Highlights of the trails will undoubtedly be the chance of sighting leopard, finding roan drinking water from one of the many natural rock pools, or stalking a herd of sable antelope, while one can keep his/her mouth busy with wild berries. For those with interests of a more botanical nature, perhaps one of the most distinguishing characteristics of the Waterberg is the vegetation. 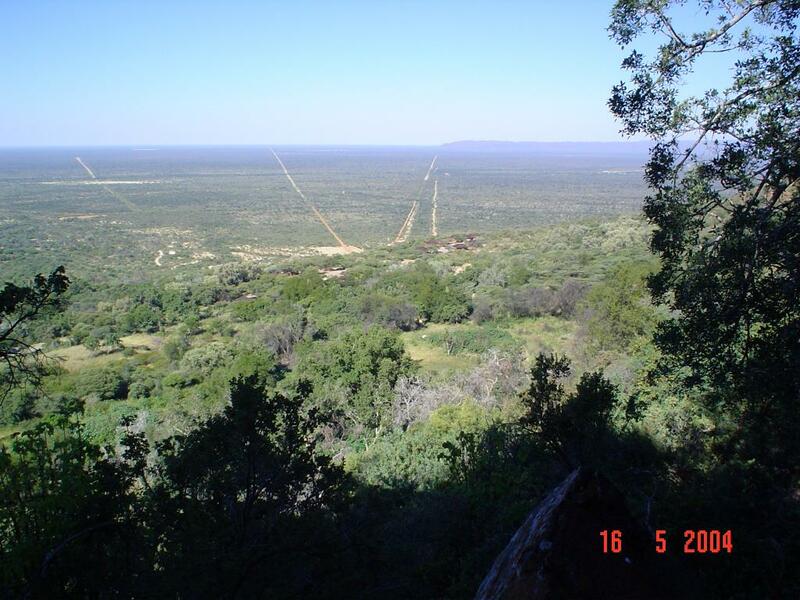 The microclimate associated with the Waterberg has resulted in a dense, broad leafed deciduous vegetation type cover, which contrasts markedly with the thornbush savanna vegetation type of the plains below the plateau. Within the woodland savanna wilderness, magnificent specimens of various interesting plant species, to be seen on the trails, are found to occur. - Trails are conducted on the second, third and fourth weekend of every month, from April to November. 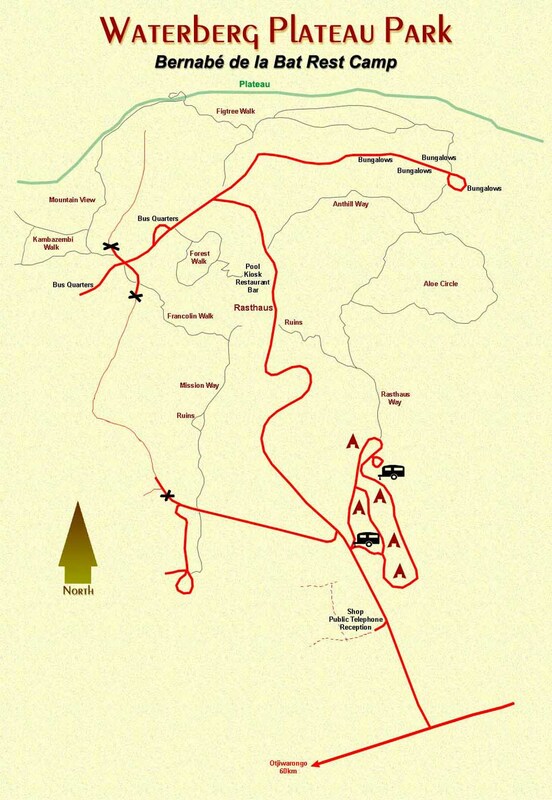 - The trail begins on the Thursday afternoon and ends early Sunday afternoon. People who have booked for the trail must arrive at the Onjoka office to be let into the park between 14h00 and 16h00 on Thursday afternoon. - Only one group (minimum 6 and maximum 8) will be taken on the trail each weekend. - Place bookings must be made in advance. Payment may be made either at this booking office or at the Onjoka office at the start of the trail. - Travelling time from Windhoek to Onjoka is approximately 5 hrs. - All vehicles will be left at Onjoka from where a park staff will take the group, together with all their personal effects, in a four wheel drive vehicle to the base camp on the plateau. - The distance covered during the trail each day will depend very much on the general fitness of the group, but will not exceed 15 km per day. - Evenings will be spent peacefully around a campfire chatting and listening to the sounds of the wilderness. - Early Sunday afternoon, when the camp ends, the group will be transported back down to Onjoka. 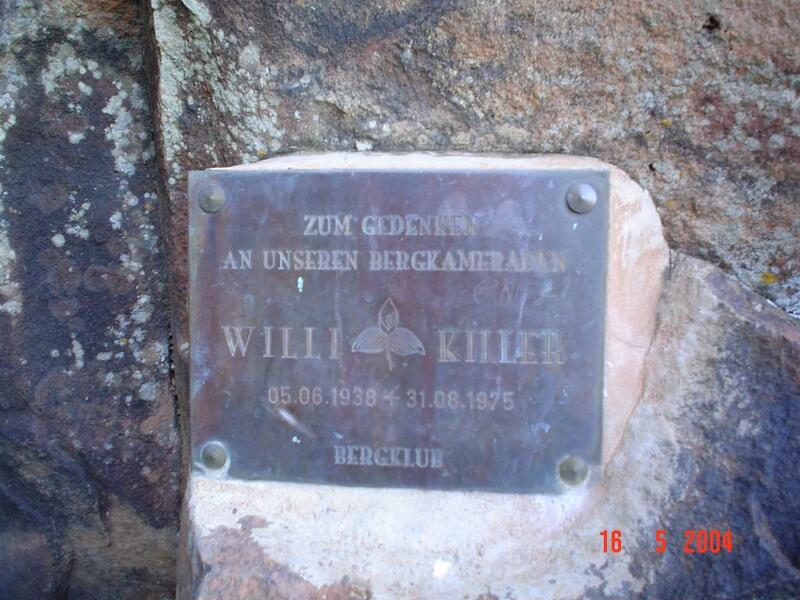 - Children under 12 years of age will not be permitted to participate in these trails. The technology has made tremendous advancements. No one can get high salary job without getting knowledge about latest technologies. It has become necessary to get IT Certifications like Microsoft 70-236 exam, CompTIA�s A+ 220-602 and SY0-101 exams. The other vendor�s certification exams such as 646-204, CCNA 640-553 and Cisco 350-030 play an important role in IT networking field.